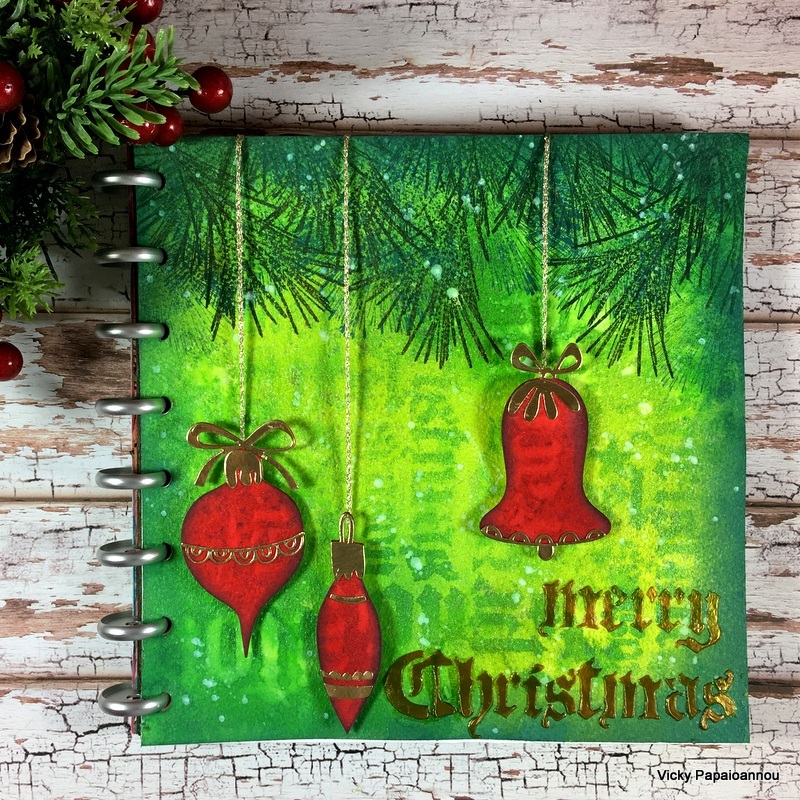 After popular demand today I am back with a Christmas art journal. A lovely layout in a traditional color combo. I kept everything in shades of green and red and added touches of gold. 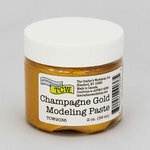 Scroll down for a video tutorial, list of supplies and some sales on the products I used. 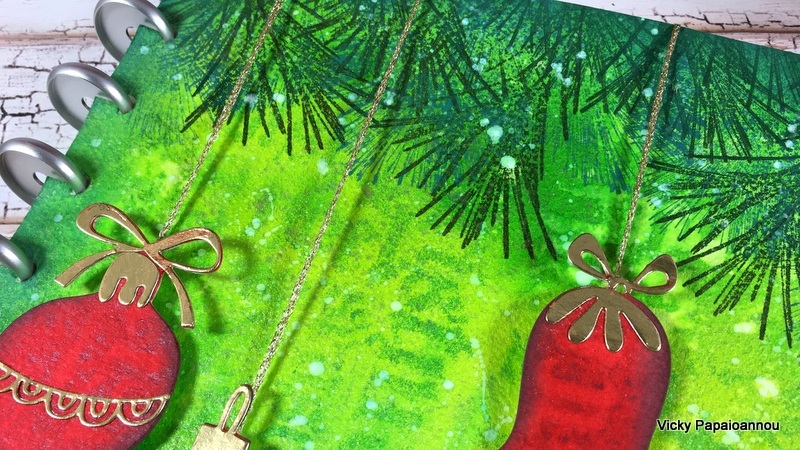 I used lots of fun mixed media techniques to create my Christmas art journal page today. Techniques that I love and use again and again. For the background I used my shimmer sprays Fresh Lime( SBC | SSS ) and Cut Grass( SBC | SSS ). They add the perfect shine to a festive project. 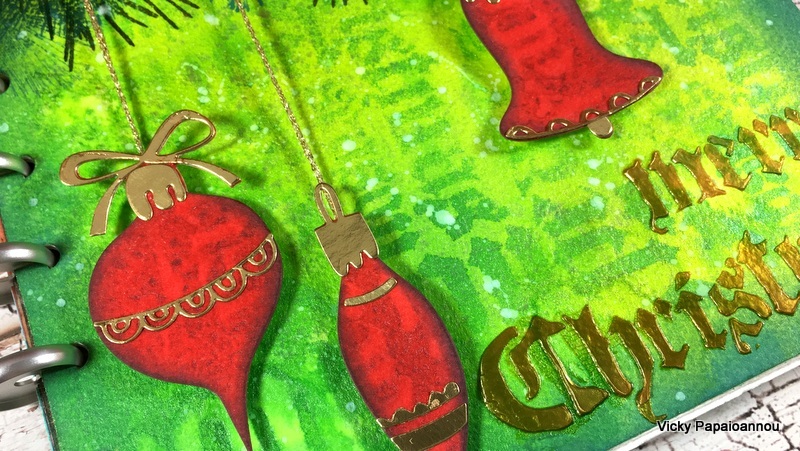 For some visual texture I also used the ghosting technique and some spraying over the Tim Holtz – Holiday Stencil ( SBC | SSS ). At the top of my page I did some stamping using the Darkroom Door PINE CONES stamp. I did a couple of layers of stamping for a fuller look. Notice that the stamping is not perfect. This is thick watercolor paper with lots of texture. 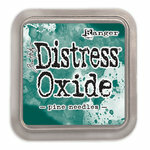 But the more you stamp the better it looks when it comes to those pine needles. 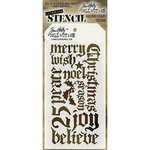 My sentiment is from the same stencil that I used on the background. 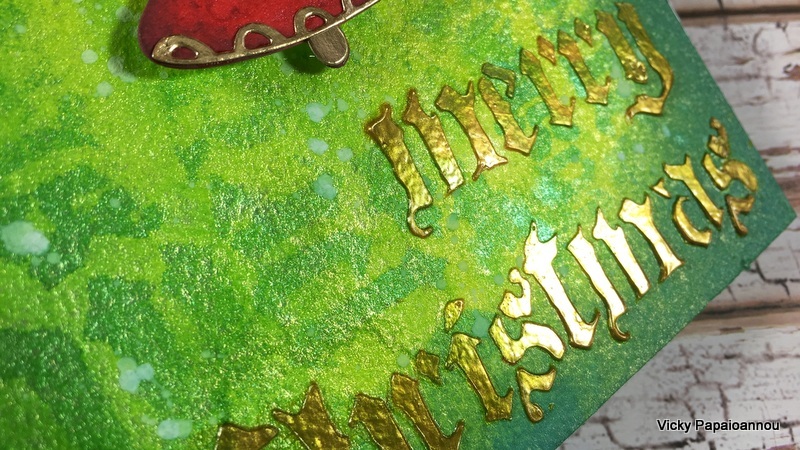 I masked off the words merry christmas and combined them on the lower right corner of my page. I used gold paste over it and look at all that shine! 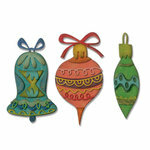 The ornaments are cut outs using the Sizzix – Whimsy Decor ( SBC | SSS ) designed by Tim Holtz. 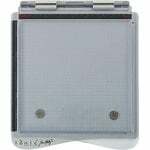 It comes with 22 dies and includes 3 ornaments and lots of embellishments to decorate them. I used only a few in gold and I love the final outcome! 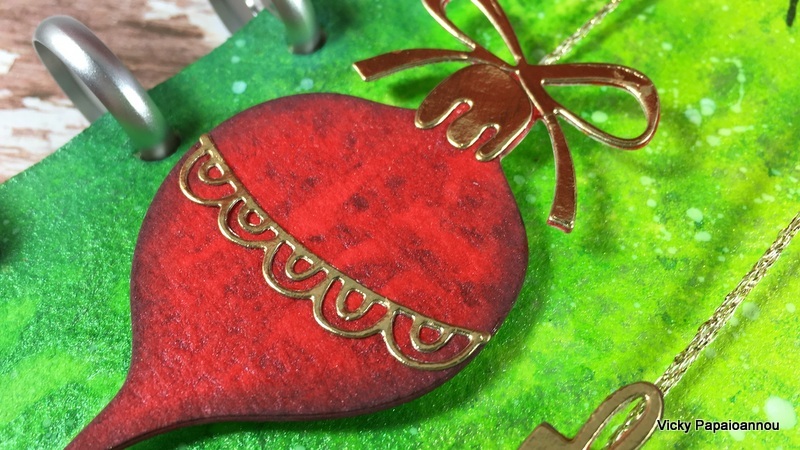 To get the same look and feel on my ornaments as my background, I created my own red paper. 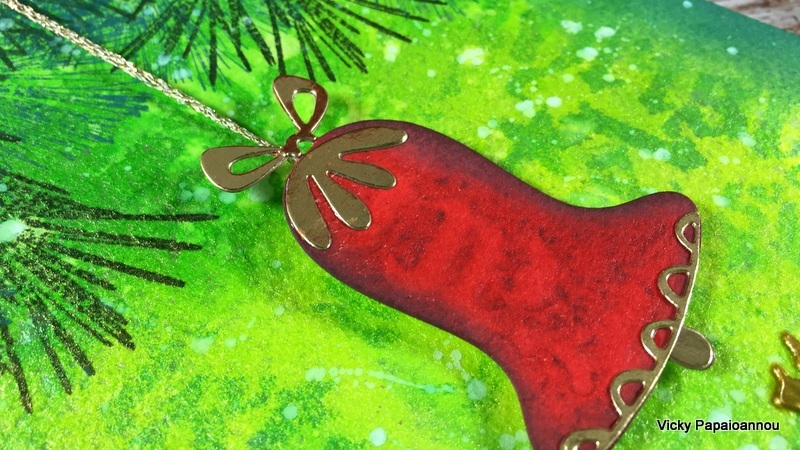 I used Postbox Red( SBC | SSS ) shimmer spray and then I cut out all my ornaments from this paper. I also like to add different textures on my pages if possible as well as dimension. So I added some golden string to hang my ornaments and foam tape to stick them down. 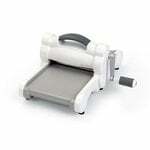 If you shop at Scrapbook.com you save 20% to 50% on everything from machines to dies! Sale ends on December 7th at midnight MST. Another “HOME RUN”!!!! I just love the background … and so simple to create. The techniques you show in this video would transfer well to making a card. One can’t go wrong with traditional colors. The red, green and gold are beautiful and striking. GREAT to see Ginger again!! (Hi, Ginger!) Glad he gave his permission for you to die cut!! Thanks, Vicky. 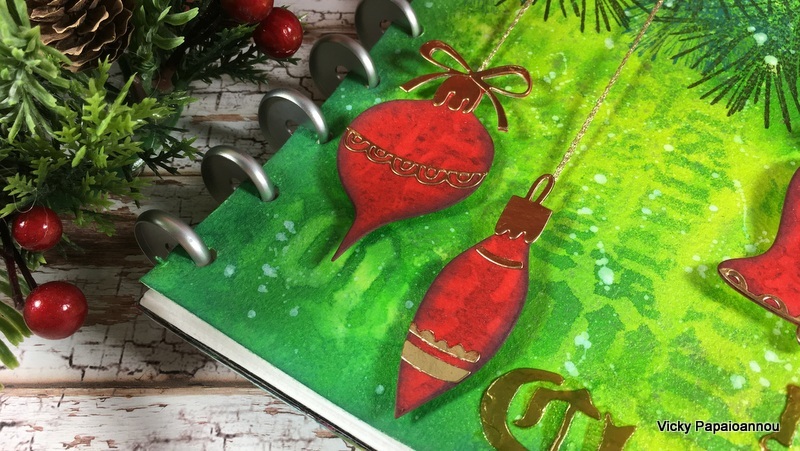 A gorgeous page Vicky, love the vibrant colours you used, especially the postbox red, awesome. This is so beautiful Vicki! Thank you for sharing your talents. Thank you! I missed your art journals! Awesome Christmas page, Vicky! Love the touches of gold here! Your art journal pages rock! And glad you popped in, Ginger! Your art journal page is beautiful. I love the colors the design and everything else about it. Thank for your video, I love watching you create. Gorgeous!!! I learn so much watching you work. Thank you. Great holiday layout! Especially loved the pine needles layering at the top and the touches of gold. And good to see you, Ginger! Beautiful festive layout. I love how you did the pine needles with the 2 layers, that adds so much to the overall look. Thanks for sharing this with us. Love this. Where do you get the disc bound journal? I can’t seem to find it.